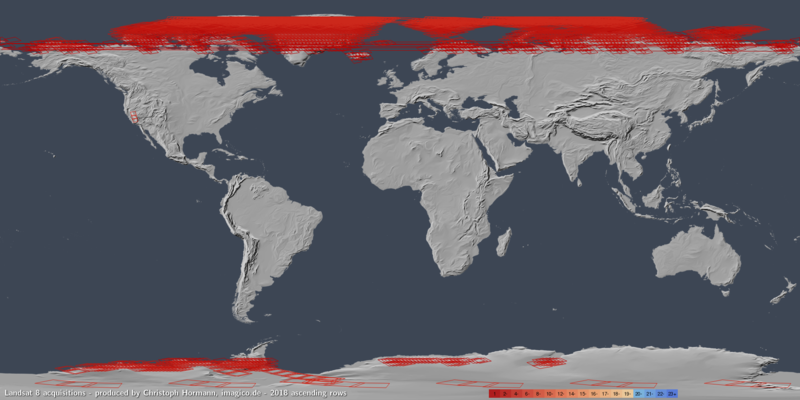 Quite a few things have happened in the world of open data satellite images since i last reported on satellite image news. You can also find updated satellite image coverage visualizations. The increased recording volume (approximately 1.5 times the recording area compared to before) is possible though data transfer via optical links to relay satellites in geostationary orbit. As already indicated in the previous report this increased recording volume is used primarily for giving up the preferential treatment of Europe and Africa in recording and now covering all major land masses except the Antarctic with a ten days interval per satellite, five days combined. In addition as also mentioned a few additional islands previously not covered are included now. To see that here the recording number maps for the 2017 calendar year as well as the incomplete 2018 numbers. The newly included islands are mostly British Overseas Territories. And in addition to the islands themselves we also see a significant ocean extent around them being included. This varies a bit between Sentinel-2A and Sentinel-2B and it seems they stopped doing that again after some time. Separate maps for Sentinel-2A 2017, Sentinel-2B 2017, Sentinel-2A 2018 and Sentinel-2B 2018 are available as well. With the increased recording capacity i have to say i find the continued catering for special interests rather annoying. 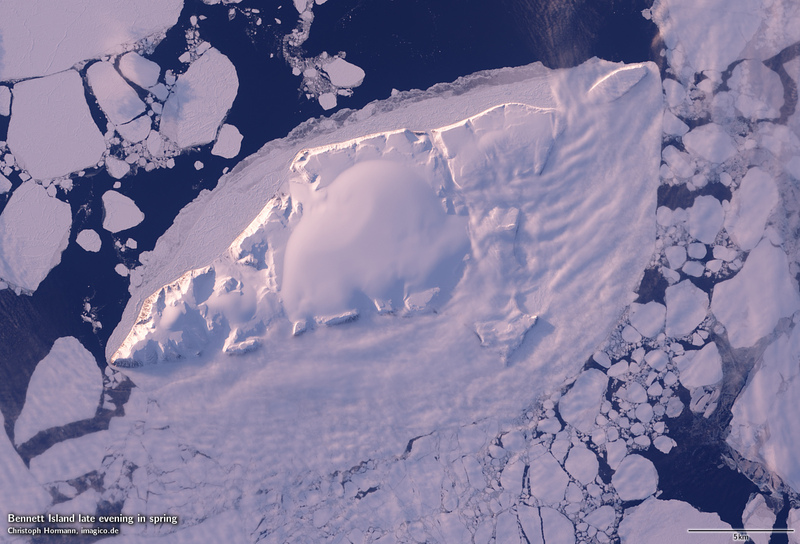 They would clearly have the capacity now to record all land surfaces at a five days interval – likely including the Antarctic, depending a bit on the recording limit due to low sun position in winter. They would slightly have to cut down on the coverage of high northern latitude for that but you can’t seriously defend having a more than daily coverage of northern Greenland at the expense of not recording various smaller islands at all. The largest islands completely unrecorded by Sentinel-2 at the moment are the South Orkney Islands. Availability of the data access – which was very bad the previous year as most Sentinel data users have seen first hand – has improved quite a bit. 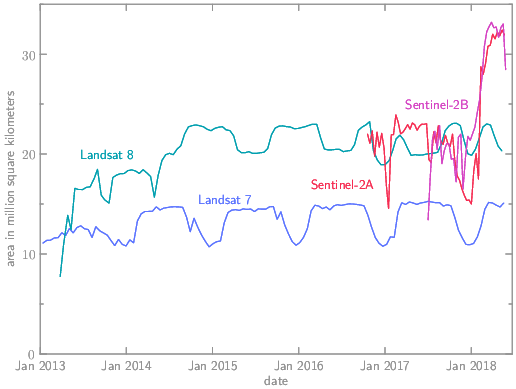 Publication timeliness is still quite bad for Sentinel-2 data with 16 percent of the packages being published more than 48 hours after recording. And this probably does not even include the unpublished packages i mentioned previously (i.e. packages that are never published). 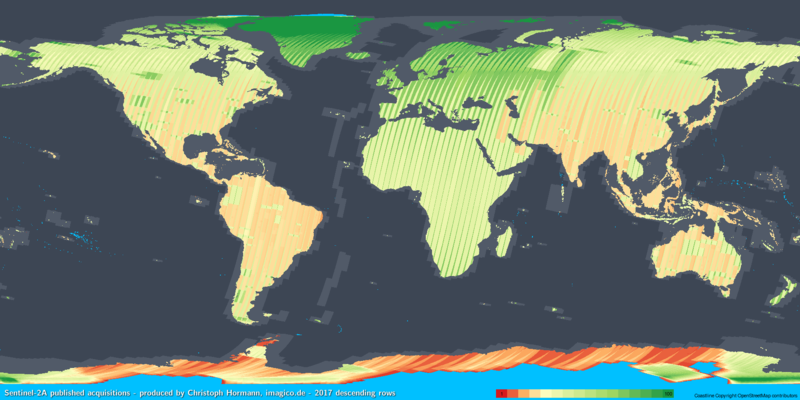 And you need to see this also in relation to the fact that more than half of the Sentinel-2 data products downloaded are less than two days old. Predictable availability of data is one of the key criteria for routine data users. In terms of trends it seems the data use via open access channels is growing faster than via all the other channels. And data use is growing much faster world wide than in Europe. The report also mentions for the first time AFAIK plans for long term availability of the data. So far all recorded images are available for immediate download which requires a quite large and continuously growing direct access storage capacity. This is supposed to be changed in the future in a similar way as it is done by the USGS, i.e. that you will have to request older products which are then made available with some delay. The plans for that as sketched are pretty specific and quite reasonable – delays are supposed to be at maximum 24 hours and requests are meant to be scriptable. ESA has announced that they are planning to re-package the larger multiple tile Sentinel-2 data packages from the first year of operation into single tile packages. Actual reprocessing of older data is not planned before 2019. Sentinel-3B, the last of the dedicated satellites of the Copernicus program, was launched with much fanfare in April. No data is available yet and from past experience with Sentinel-3A it is unlikely this will happen any time soon. Even for Sentinel-3A they are still keeping back some of the higher level data products from the general public. The USGS has crippled the Landsat bulk metadata download options. You can still download bulk metadata packages but this is not completely up-to-date and at least for Landsat 7 it is very incomplete. Other metadata you can now only get through EarthExplorer in a manual, not scriptable fashion. This makes analysis of image recordings like i show above much more difficult. Seems like USGS and ESA are converging here. Otherwise Landsat operations are pretty much business as usual. It seems the USGS has significantly increased the number of night time (ascending orbit) acquisitions at high latitude in 2018. See the plot for all of 2017 in comparison to 2018 so far. An example can be found below. Plans for launching Landsat 9 in late 2020 seem to be pretty definite now – not really much room for delays there with Landsat 7 being bound to reach the end of useful life soon afterwards. Another topic i want to mention: There has been some fuzz about the idea of reverting the decision of opening access to Landsat data being contemplated by the US government. This started with an article on the matter. To me it seems the complaints and cry-out about the mere idea of this kind of stood in the way of seeing what the real background of this is. Most people who have voiced their objection to this argue that it does not make sense from an overall economic standpoint and that both private sector and science profit so much from open Landsat data that this more than compensates for the costs. The problem is that this is not how political decisions are made. Political decisions are a matter of interests and the power that stands behind them. Which interests have the strongest influence on the decision making process here is kind of hard to predict here but in any case I don’t consider the science lobby to be of significant power here, in particular not with the current US administration. In any case the most likely effect such a discussion on the political level will have is on the planning of the future of the Landsat program in terms of financial scope and capabilities. Landsat 9 (as mentioned above to be launched in late 2020) will be a fairly direct copy of Landsat 8. Discussion on the capabilities of future Landsat 10 is currently in progress and it seems the timing of the political discussion could be directed at influencing that. And what some people also forget is that you can’t really close open data you have already published for free and unrestricted use. So the Landsat archive data will remain free to use (though not necessarily available through the USGS) in the future even if the US government decides to stop open access to new images at some point.